The installation aimed to send the previously established project-based Austrian artist Georg Paul Thomann (1945-2005) as official Austrian representative to the São Paolo Biennial. For this reason, Thomann made an image-light-incarnation-installation ("Self-portrait as Austria’s Highest Mountain [I’m Winning My Religion]"), in this context he worked as artist-curator and presented four young Austrian artists and artist groups (320x200, Tonki Gebauer, monochrom and Richard Wientzek), including himself as the centre of this staged mental map; as Großglockner (the highest Austrian mountain), around which the four groups or individual artists resided like holiday resorts. This approach tries to address the problematic of national representation in an art context – being neither able to represent a country nor willing to do so – and to name it further. Thus, it was not only an already established big national artist, Thomann, (whose name and biography links ”Austrian art history" with all progressive avant-garde moments of art, leftist politics and pop since the 1960s), but also the artistic-creative offspring/reservoir of a country: the location factor "art.” That two of the four projects/people curated by Thomann really exist, is – like everything real, and pretty accidental at that. The aesthetic star system – the staging of the self as Thomann’s mountain in an installation that is still attributed to Thomann (also in the exhibition catalogue and the official press releases) – as well as the capitalist penetration of artistic representation in the form of the art market should be promoted and accelerated with unhindered speed, because speed always signifies disintegration. -Tonki Gebauer should programmatically overload the entropy in the field of contemporary video art as well as the New Viennese Electronic Music. Gebauer’s work represents the attempt to remix Fritz Lang’s silent film classic "The Nibelungen" from 1924 with regard to the scenes and images as well as to the underlay of a specially generated, commonplace sound track. In this regard, Lang’s film is highly interesting in terms of portraiture since it witnesses the establishment and propaganda of racist stereotypes in the fairly young medium of film. – Lang’s Huns seem to empathise with termites in prototypical Nazi diction: stooping, light-sensitive, in earth holes living creatures, whose existence forms a strange kind of teeming. – Moreover, he co-founded the medial tradition of heroism, which is mainly based in the explicit depiction of violence. The coupling of (colonial) power and heroism was fostered by the newly generated possibilities of visualising filmic-photographic reproduction. To emphasise this aspect, the video was cross-edited with the ubiquitous composition elements of war reportage on CNN, e.g. scenes of the nightly sky during the operation "Desert Storm" or flashes of channel logos. At the same time, through the reference to the Nibelungenlied, the national contexts of representation in the 18th century were functionalised and re-edited: Lang’s film per se is explicit through the insert "Dedicated to the German people," which is joyously reiterated though the editing technique of the remix. On the other hand, the Nibelungenlied provides a text, which is free from historical overload and uses and not in the least understandable for today’s recipients because its epistemological inscriptions can also not be decoded on a philological level. The thinking modes formatted in the text remain closed off for today’s readers: "Oh my God, they use a history which repeats itself", is what Gebauer lets a Hun call with a text insert. The usage of known, sometimes altered quotations of the repertoire of Pop culture might establish an iconographic link between traditional and current modes of representation and thus refers to the epistemological context, which is narrated along with the (bourgeois) idea of representation itself. At the same time, the references to material aesthetics in the sound track recur on current forms and material treatments in electronic music, which works with this aesthetic idea of representation in a new, but loyal form, e.g. when Gebauer uses a worn-out CD-burner as a percussion instrument with Wireless L@n adapters (at 25:06 minutes of the sound track). 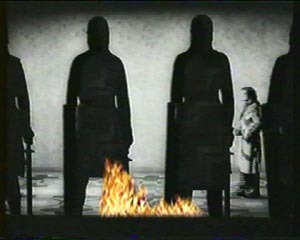 Similar picture editing strategies try to connect the Niebelungenlied in its filmic interpretation by Lang as a visual event according to the critical level of consciousness in terms of editing as well as the fulfilment of the tasks of the elevated entertainment needs, to contemporary, avant-garde or progressively oriented contexts. It is not possible to not fulfil these expectations in the end! What we are dealing with especially is the depiction and perception of real and existing contexts along with their genre-specific filmic adaptation: the experiment. Furthermore, also because it is fun to speak like everybody and say: the sun rises, provided that everybody knows that this is idiomatic speech. Hence there were attempts to stage several pre-formatted video effects of the editing programme as festivals of themselves within the film. Such a structural-aesthetic surplus is owed to the attempt to generate visual effects in over-extension and to live the technically possible access as permanently excessive demand of the arbitrary. Picture duplications and reflections, the introduction of a continuously promoted painting of the academic painter A. Hitler etc. tells the street ballad of the loss of the primary level of narration – which, already inherent to the master copy of the text, albeit only selection wise – and can only be generated as pseudo rhizomatic floristic series and line-ups. Instead of pursuing a deterriorialisation of the found material, this contemporary challenge of technology only facilitates a re-terrotorialisation as trash-bound psychedelics, as it only stifles the starting material, Lang’s film, at relative speed. 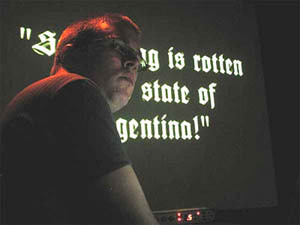 What became a very special problem upon making the film was Gebauer’s talented dilettante inability to synthesise (demanding a high level of professionalism, which was not accessible to the participants, otherwise they would already be earning a lot of money in the IT business), and at the same time de-counterfeit calculable eruptions of taste in naturalistic, though slightly teasing manner. Originally, the film should only facilitate the ad hoc completion of the fourth project, which was not yet defined in the installation planning of ”Tonki Gebauer." The tasks listed for this occasion (according to the protocol of the preparation meeting of December 29, 2001): "Something should be going on so that the exhibition does seem real. Let’s just put up a monitor and a VCR, that’s cheap anyway” was totally over fulfilled. Instead of being just something, Gebauer’s film is a sophisticated and strongly defined document of human eagerness for creation. In the end, Gebauer’s filmic scenario turned out to be the most expensive element of the exhibition. Unfortunately, the last 10 % of failure took up 90 % of the time. Not to mention money. The film is dedicated to the international art scene, mainly to curators and schools, which have to go through it, because they simply have to.